Plant a tree in memory of Theodore "Ted"
Be the first to share your favorite memory, photo or story of Theodore "Ted". This memorial page is dedicated for family, friends and future generations to celebrate the life of their loved one. Walla Walla resident, Theodore (Ted or T.C.) 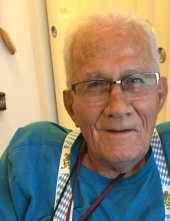 Charles Howard, 95, died peacefully Nov. 10, 2018 at Walla Walla Veterans Home. He was given a veterans tribute with a flag drape and taps. A Celebration of Life Service will be held at a later undecided date. Memorial contributions may be made to Gospel Outreach or Blue Mt. Television thru Mt. View-Colonial Dewitt Cremations & Funeral Services, 1551 Dalles Military Road, WW, WA 99362. Dr. Howard was born Oct. 3, 1923 in San Bernardino, CA to David and Mary Howard. He was the third in the line of 6. He survived polio and rheumatic fever with valvular heart disease to attend grade and high school in San Bernardino. His family was told he would not live after an auto accident left him comatose with a broken back. He surprised all and went on to graduate from La Sierra College and receive his medical degree from Loma Linda University in 1951. While at LLU, he met "the most beautiful woman in the world", Twila Schooley. They were wed on July 1, 1948 and enjoyed 60+ years together. The couple had set up medical practice in Delta, Colorado where 2 daughters were born when Ted was "encouraged" to join the service. He joined the Air Force as a 1st Leuitenant in 1953 and received an honorable discharge in 1955, as a Captain. After a number of educational moves, he accepted a family medicine position at Sonora, CA. in 1956. The Sonora Community Hospital was being built and he became a charter member. He was an active and supportive force (not just financial but hands on) for building MLJA and the SMG office building. He had a deep-rooted faith in God & His Son and was very active in the Sonora SDA Church holding positions as head elder, elder, deacon, SS teacher. He loved to sing in the choir. He was a generous supporter of mission work. Ted had a wonderful sense of humor. He was a gentle, humble, caring husband, father, grandfather, physician and friend. He gave a beautiful example of cheerfulness in adversity. His most loving, selfless act was when he moved from his beloved Sonora for his wife’s needs to be near their children who could help. He shall be greatly missed! He is survived by two daughters/son-in-laws. Sid & Aileen Litchfield of Milton-Freewater, OR, and Wayne & Jeanine Kablanow of Chatteroy, WA; a sister, Harriett Manning of Calimesa, CA; four grandchildren and 2-great-grandchildren. To plant a tree in memory of Theodore "Ted" Howard, please visit our Tribute Store. "Email Address" would like to share the life celebration of Theodore "Ted" Howard. Click on the "link" to go to share a favorite memory or leave a condolence message for the family.